This is a 5-course, plant-based dinner, inspired by the fresh and local produce of the Farmers Market. Every week we theme these dinners differently so that the spirit of what is going on in our community can infuse the ingredients and give us something to talk about together. As Art Basel invades our city this month, we look to the artists we love to give us inspiration. 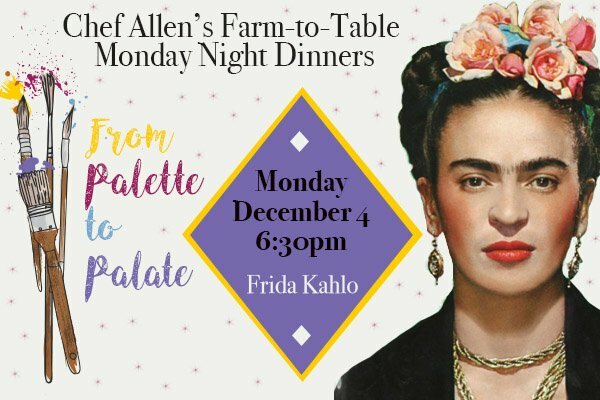 Tonight, we celebrate the one-and-only Frida Kahlo. Mexican artist Frida Kahlo is remembered for her self-portraits, pain and passion, and bold, vibrant colors. Life experience is a common theme in Kahlo’s approximately 200 paintings, sketches and drawings. Her physical and emotional pain are depicted starkly on canvases, as is her turbulent relationship with her husband, fellow artist Diego Rivera, who she married twice. Of her 143 paintings, 55 are self-portraits. (between Northeast 12th and 13th streets).